In 1809 the British drove the French out of what before 1797 had been Venetian territory and annexed the islands in 1814. The first lord high commissioner, Sir Thomas Maitland, who as governor of Malta had acquired the sobriquet of King Tom, was not the man to foster the constitutional liberty of an infant state. The treaty required, with questionable wisdom, that an institution should be established, and this was accordingly done; but its practical value was trifling. The constitution, voted by a constituent assembly in 1817 and applied in the following year, placed the administration in the hands of a senate of six members and a legislative assembly of forty members; but the real authority was vested in the high commissioner, who was able directly to prevent anything, and indirectly to effect almost anything. Sir Thomas Maitland was not slow to exercise the control thus permitted him, though on the whole he did so for the benefit of the islands. The construction of roads, the abolition of direct taxes and of the system of farming the church lands, the securing of impartial administration of justice, and the establishment of educational institutions are among the services ascribed to his efforts. These, however, made less impression on the Heptanesians than his despotic character and the measures which he took to prevent them giving assistance in the Greek war of independence in 1821. He was succeeded in 1823 by General Sir Frederick Adam, who in the main carried out the same policy. Under his government the new fortifications of Corfu and some of the most important public works which still stand were undertaken. Lord Nugent, who became high commissioner in 1832, was followed by Sir Howard Douglas, who ruled with a firm, too often with a high hand; and he was met by continual intrigues, the principal exponent of the opposition being the famous Andreas Mustoxidi. A complete change of policy was inaugurated by Mr Mackenzie (1841-1843), and his successor Lord Seaton (1843-1849) was induced by the European disturbances of 1848 to initiate a number of important reforms. But the party which wished for union with Greece was rapidly growing in vigour and voice. 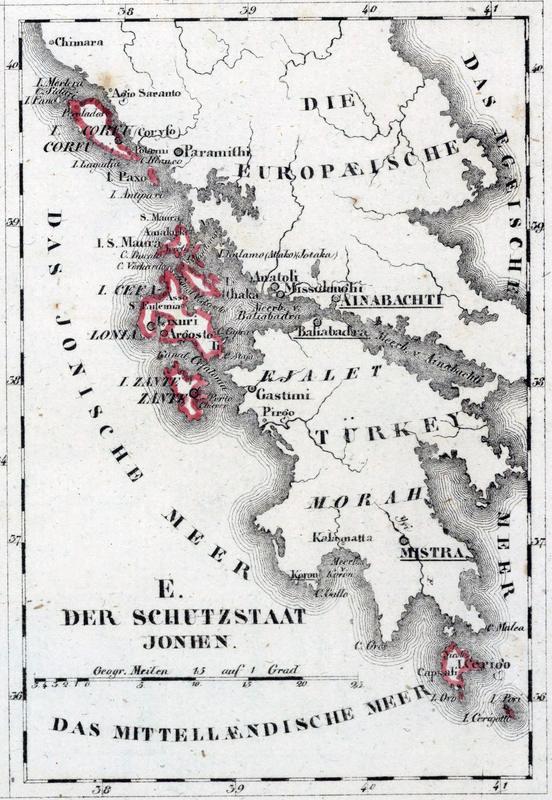 Serious insurrections of the peasantry, especially in Cephalonia, had to be put down by military force, and the parliament passed a resolution in favor of immediate union with Greece. The hopes of the unionists were roused by the appointment of W. E. Gladstone as high commissioner extraordinary to investigate the condition of the islands. From his known sympathy with Greek independence, it was their expectation that he would support their pretensions. But after a tour through the principal islands Gladstone came to the conclusion that the abolition of the protectorate was not the wish of the mass of the people. For a few days in 1859 he held office as lord high commissioner, and in that capacity he proposed for the consideration of the assembly a series of reforms. These reforms were, however, declared inadmissible by the assembly; and Sir Henry Storks, who succeeded Gladstone in February 1859, began his rule by a prorogation. The contest continued between the assembly and the protectorate. The British government was slow to realize the true position of affairs: as late as May 1861 Gladstone spoke of the cession of the islands as a crime against the safety of Europe, and Sir Henry Storks continued to report of tranquillity and contentment. 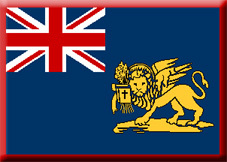 The assembly of 1862 accused the high commissioner of violation of the constitution and of the treaty of Paris, and complained that England remained in ignorance of what took place in the islands. On the abdication of King Otho of Greece in 1862 the Greek people by universal suffrage voted Prince Alfred of England to the throne, and when he declined to accept the crown England was asked to name a successor. The candidate proposed was Prince William George of Glucksburg, brother of the princess of Wales; and the British government declared to the provisional government of Greece that his selection would be followed by the long refused cession of the lonian Islands. After the princes election by the national assembly in 1863 the high commissioner laid before the Ionian parliament the conditions on which the cession would be carried out. 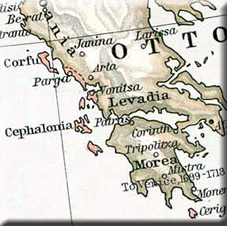 The rejection of one of those conditions the demolition of the fortifications of Corfu led to a new prorogation; but none the less (on March 29, 1864) the plenipotentiaries of the five great powers signed the treaty by which the protectorate was brought to a close. On May 31st of that year Sir Henry Storks left Corfu with the English troops and men-of-war. King George made his entry into Corfu on the 6th of June.